The Kravitt & Coombs Knife is available for online purchase on this page. For custom work, email me at Sheathmkr@aol.com. Thanks! In 1988 I designed the knife that is now known as the Kravitt & Coombs knife. I was no knifemaker, but I played around at it once in a while. After making that first knife and using it for several months, I realized that I’d come up with a really good design. Over the next 3 years, I had 58 of them made by knifemaker Bob DeFarges. Beginning in 1991, I began having the up-and-coming knife maker Lamont Coombs Jr. make them for me, and the Kravitt & Coombs was born. Since then over 200 of them have been made. The basic knife is made of O-1 steel, hardened to Rc 57-58. That is what my original knife was, and it worked! 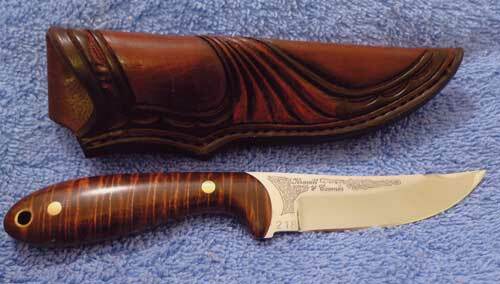 The basic knife has beautiful cocobolo scales, and of course a deluxe custom fitted Treestump Leather sheath. The overall length is 6½" with a 3" blade, all for $189 plus $12 S&H. A few have been made with ATS-34 by special order and there have been a few very deluxe versions with Sanbar stag, nickel silver bolsters, mosaic pins, and beautiful file work. These are occasionally available starting at $300. Inquire directly if interested in the deluxe version.